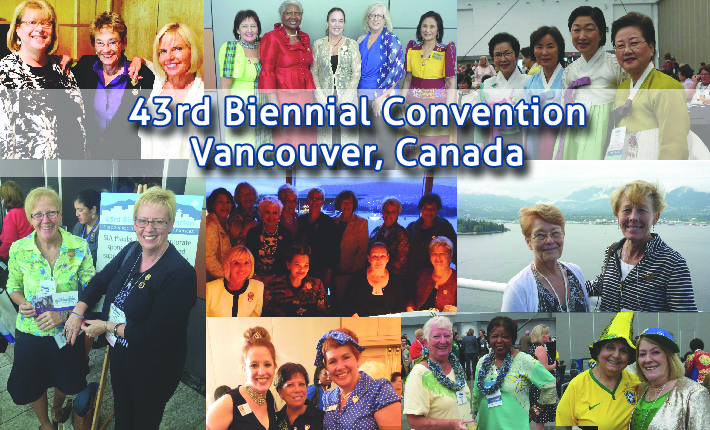 A heartfelt thank you to everyone who attended SIA’s 43rd Convention in Vancouver! We hope you had a wonderful experience. And for those who couldn’t attend, check out the convention photo album on Facebook. The Vancouver recap page—to see video clips, which clubs and regions received awards and to view workshop presentations—will be available soon. A special thank you to keynote speaker Patti Dobrowolski for sharing three additional ways to keep your “vision to reality” map alive. Her book, Drawing Solutions, sold out at convention, but you can order it here! Click here to read a synopsis of significant actions taken by your SIA Board at its recent meeting in Vancouver. Mark your calendars for the 44th Biennial Convention, July 20-23, 2016, in sunny Orlando, Florida! President Poco Kicks off New Club Year! SIA headquarters recently received word that the Outloook.com email system utilized for our free “@soroptimist.net” club email addresses would be making security changes that make it very difficult for headquarters to troubleshoot and administer the club email system. Headquarters technology staff are working to find both short-term and long-term fixes to the system. Keep watching the Soroptimist Summary and other communication from headquarters for more information in the next few months. Nominations for positions on the SIA Board of Directors are being accepted from clubs in the following regions: Western Canada Region (Electoral Area 2), Japan Kita Region (Electoral Area 4), America del Sur Region (Electoral Area 6), Philippines Region (Electoral Area 7), Japan Chuo Region (Electoral Area 8) and Founder Region (Electoral Area 10). Nomination forms are on the SIA website, and were sent by postal mail to all clubs in early August. Nominations are due to SIA headquarters on September 15. Nominations for positions on the Fundraising Council are being accepted from all clubs. Nomination forms are on the SIA website, and were sent by postal mail to all clubs in early August. Nominations are due to SIA headquarters on September 15. During convention in Vancouver, the delegates considered six proposals to amend the SIA Bylaws, and considered two resolutions. In early October, all clubs that are in good standing (that is they have met their financial obligations to SIA) will be able to participate in the mail ballot to determine the final outcome of these proposals. Ballots will be mailed to all club, and all information will also be available on the Federation Information page of the SIA website in all languages in early October. Ballots will be due back to headquarters in early December. To read more, click here. Click here to see a list of Laurel Society members who made a contribution since September 1, 2013. Last year, the 2012-2014 governors and governors-elect signed an oar symbolizing their commitment to catch the wave of change and row together toward increased collective impact. The oar was put up for auction to the highest bidder at the past governors breakfast in Vancouver, which was SI/Garden Grove, California (Desert Coast Region) club President Linda Cahill. Thank you, Linda, for your generous gift that will support programs working to change the lives of women and girls around the world! New name! New program! New materials! New designs! New videos! Everything your club needs to support the Live Your Dream: Education and Training Awards for Women (formerly the Women’s Opportunity Awards) and Dream It, Be It: Career Support for Girls is available on the SIA website. Last year, SIA supported 16 SIA club education and leadership projects through SI President Ann Garvie’s December 10th Appeal. We are very pleased to be able to offer the same opportunity to clubs this year! Looking for a new project? Need resources to increase the impact of an existing project? Need some background information about topics facing women and girls? Check out the program section of the website for all the information your club needs to make your project a success! You may have heard it said: Soroptimist is the best kept secret. And no wonder, we work silently in the background raising money and giving it to other organizations to further their missions and programs. But what about our mission, our programs? Why don’t we invite others to help advance our cause? 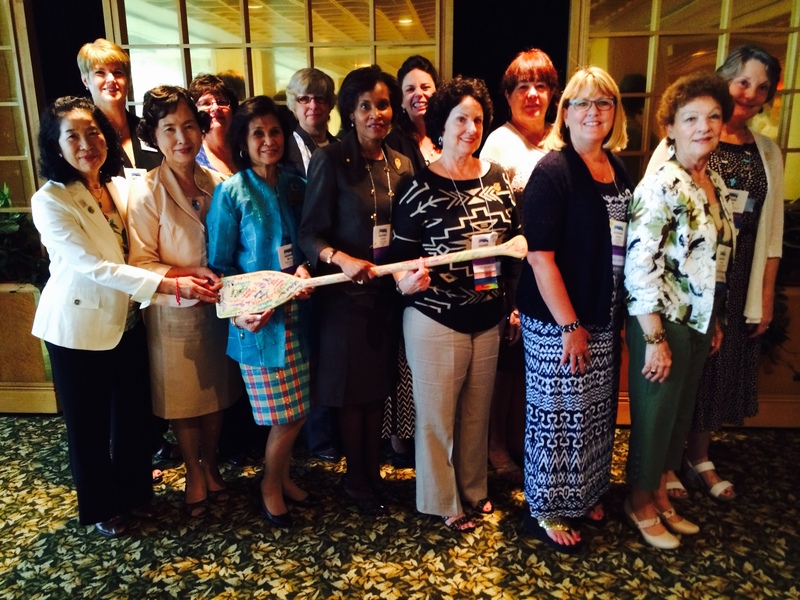 In June 2014, Past President Cheri was invited to present a panel discussion at Zonta’s International Conference. The subject was Zonta on the Global Stage—Effective Partnerships. Cheri discovered many Zonta clubs were intrigued by Soroptimist and inquired how they might partner with local Soroptimist clubs. Your SIA leadership encourages you to partner with other like organizations to help ADVANCE OUR mission and programs. So please, reach out to a local Zonta club and ask them to help you advance our cause by partnering to grow the number of applications and cash awards given for the Live Your Dream Award. For more information on creating partnerships, click here or email program@soroptimist.org. Help Shape the Soroptimist Future! As you begin planning for the 2014-2015 club year, become a part of the Soroptimist team by supporting SIA’s strategic direction! The SIA Club Road Map for Success in 2014-2015 is a simple set of guidelines for clubs on how to support our federation’s 10-15 year big goal to increase our collective impact. Find out how your club and members can strengthen our organization by helping to shape the Soroptimist future. Be sure to check out the Road Map for Success (which will also be in the next issue of Best for Women) and find out how your club can earn a certificate for its role in helping to achieve our big goal! 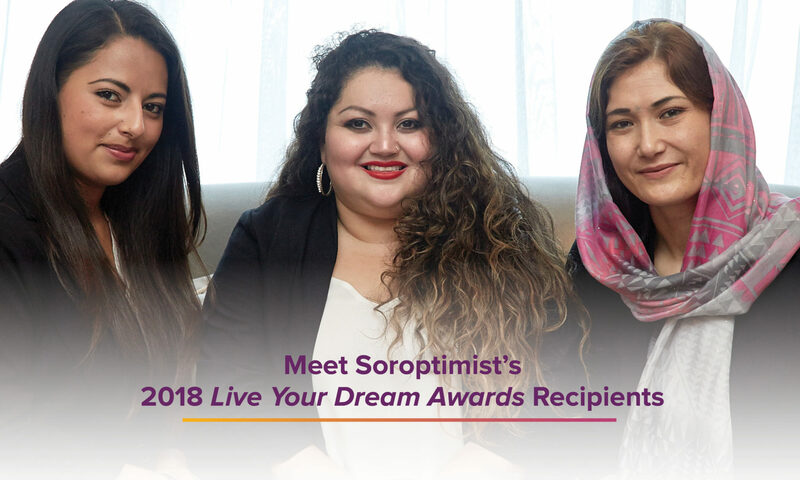 This year’s contest pays tribute to Soroptimist’s new program, Dream It, Be It, which provides girls with resources to achieve their career goals. In honor of this exciting initiative, we invite students ages 4-18 to draw or paint a picture of a working woman they know and admire. Finalists will be featured on the Live Your Dream Facebook page (www.Facebook.com/LiveYourDream.org) throughout February, with winners announced on March 8, International Women’s Day. 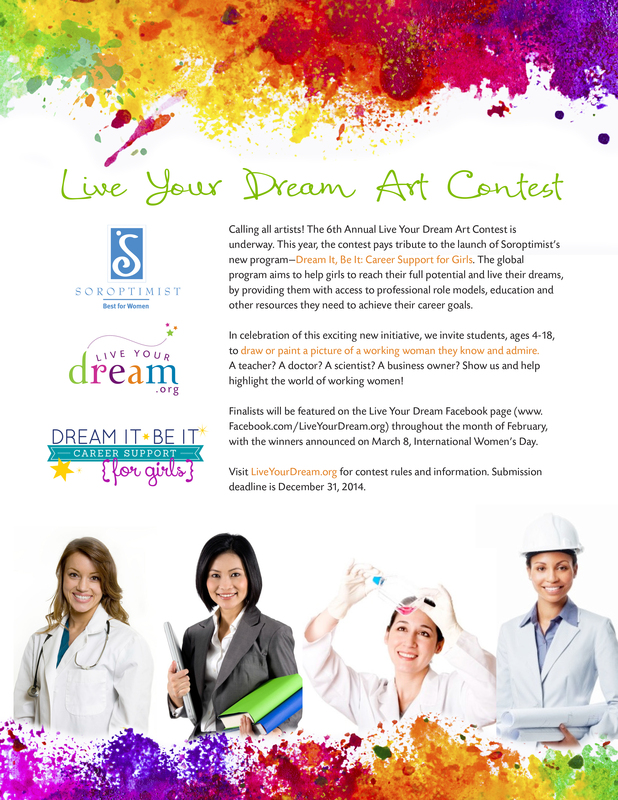 Clubs can find materials to promote this year’s contest in the Live Your Dream Guidebook section of SIA’s website, or direct participants to the art contest section of LiveYourDream.org. The submission deadline is December 31, 2014. SI held its most recent board meeting last month. Please visit the members area of the SI website to read about the SI Board’s deliberations and the outcomes of the meeting. Soroptimist International is seeking applicants for three international positions: SI treasurer 2015-2017, SI international programme director, and SI assistant international programme director. Information on each of the positions and applications can be found on the Soroptimist International website (login required: username- member; password- cambridge; case sensitive). To apply for the SI treasurer position, please use the application on the SIA website. Applications for all positions must be received at SIA headquarters (siahq@soroptimist.org) no later than October 15, 2014 for verification of member status.